Very pungent cool fresh taste. Many claim it calms the digestive system and relieves heartburn, stomachache and nausea. 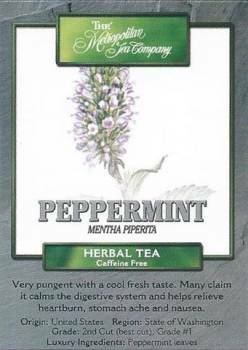 This Peppermint Herbal Tea (Mentha Piperita) is a product of Washington State in the U.S. For centuries, herbs have been consumed for medicinal purposes in every corner of the globe. Subsequently, folk remedies for the treatment of a multitude of aliments abound the world over. Here's to your health!